'Emergency Assist 2.0' will try to wake you up before taking the wheel. The system is called Emergency Assist 2.0, and it takes advantage of four existing VW safety programs: Adaptive Cruise Control, Side Assist, Lane Assist and Park Assist. The Arteon will notice if a driver hasn't touched the gas, brakes or steering wheel for a certain length of time, and it will attempt to "wake up" the person with sounds, visual cues and even a physical brake tap. If that doesn't work, Emergency Assist 2.0 takes over: The car's hazard lights switch on and it steers itself to a safe, nearside lane. The system uses Lane Assist to recognize lines on the road and Park Assist to actually steer the car. Radar detection via Adaptive Cruise Control and Side Assist helps ensure the Arteon won't hit any other vehicles. This type of technology isn't new. Vehicle manufacturers like BMW have been toying with similar emergency systems since 2009, at least. However, that was back when driverless cars were still the stuff of pipe dreams. 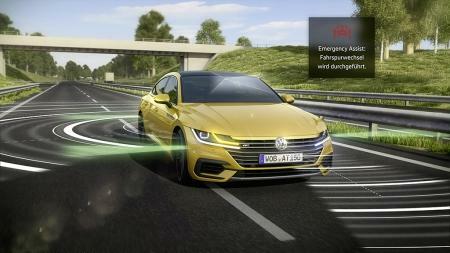 Today, autonomous-vehicle technology is becoming more ubiquitous by the second, and the Arteon's Emergency Assist 2.0 -- a self-driving system in a traditionally controlled car -- is a testament to this growing industry.